Il Campionissimo: A Double Success! "Every time Coppi won a crushing victory it added a bit to his legend." This May 9th marks the Centenary of the Giro d'Italia with stage one, the TTT in Venice. The monumental stage race will reach an epic milestone of 100. A rich history along with it's unforgettable star riders is the stuff of legend. The great Fausto Coppi certainly ranks as one of cycling's fascinating legends. He was so elegant on the bike that rival Gino Bartali described him as, "a god on the bicycle, fluid form in motion." He ushered in radical training methods and diet that revolutionized the sport. 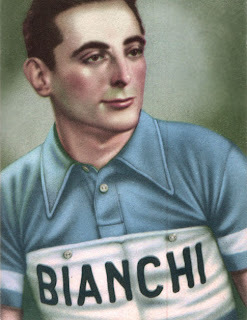 He had already won the Giro (1940 & 1947) and set the new world hour record on the track in 1942. Italy was divided between Bartali & Coppi. On one hand, the aging Bartali was the waning champion, on the other, Coppi the rising star and great hope. 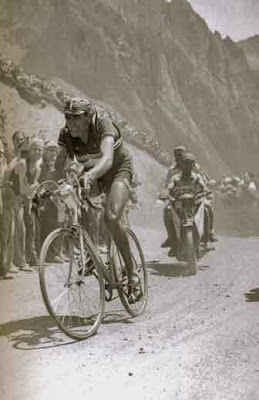 In the 1949 Giro d'Italia, organizers included such a tortuous mountain stage that the winner would become an instant legend. It was a mammoth stage of 254 km including the climbs; Madelaine, Izoard, and Sestriere. It was made for Coppi as he cruised to victory nearly twelve minute lead over Bartali. Coppi took three stages, the maglia verde (mountains classification) and the overall. Gino Bartali could only follow in second overall 23 minutes behind. A week following, the two combatants lined up at the Tour. It was the time of national teams, but both were reluctant to ride with each other. Bartali was the distinguished team leader and Coppi, in his Tour debut, as the duty-bound second. 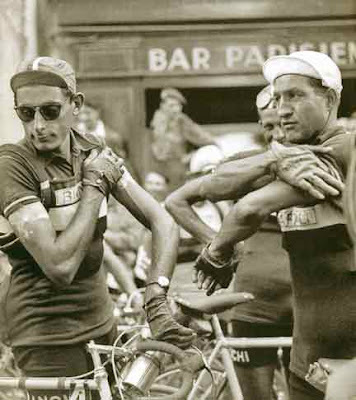 Stage five almost had Coppi close to abandoning. After falling and destroying his bike he had to wait a long seven minutes for a spare. He was give a sub-standard bike but managed to finish the stage, over thirty minutes behind the race leader. A determined Coppi began to take back time winning three stages including the 92 km TT, taking the maillot jaune with stage 17 victory into d'Aosta. The piece de resistance was Coppi's incredible 137 km ITT win on stage 20 to Nancy. He took seven minutes from Bartali and held the yellow jersey to Paris. Sixty years ago, Coppi became legend as the first man to win the tours of Italy & France in the same year and was named by the tifosi, 'campionissimo' ... the champion of champions. 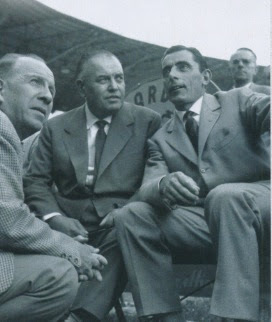 Bartali nervously eyes Coppi before Stage 11 in Pau, 1949.
on Stage 11, Pau-Luchon, 1949.